The entire team and I have the pleasure of welcoming you to the Novotel Sevilla Marqués de Nervión. We hope you enjoy your stay at the hotel and take advantage of our ideal location for exploring the beautiful city of Seville. Welcome! The Novotel Sevilla hotel boasts an impressive central location and convenient services. 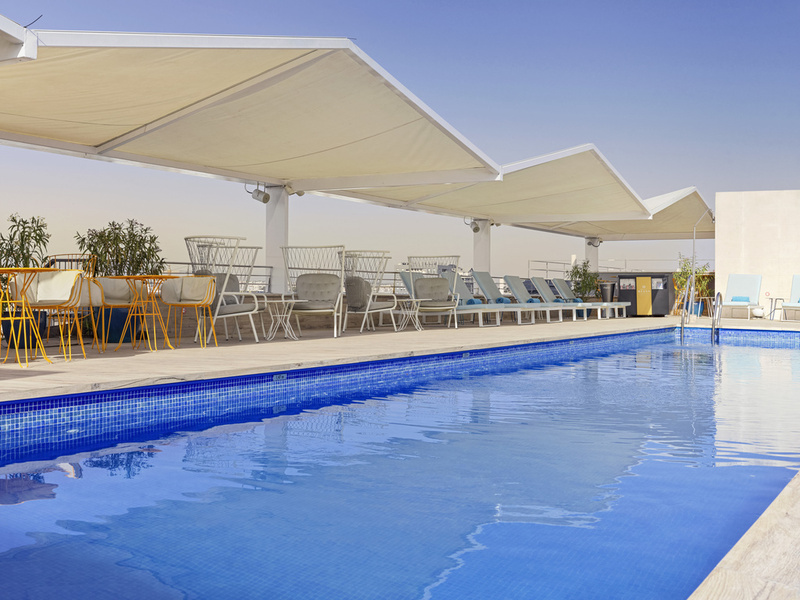 Located between the Ramón Sánchez Pizjuán soccer stadium and a 15-minute walk from the cathedral, it features a restaurant, rooftop swimming pool and children's play area. Enjoy boat trips close to the hotel or play golf 1.2 miles (2 km) away. The spacious rooms and bright meeting rooms have WIFI and are perfectly equipped. After a long day, take a break at our restaurant bar. Seville is a colorful city, known for the charm of its people, its art and its gastronomy, and the mixture between Christian and Islamic culture is evident in the downtown area. Relax and take a stroll along the Guadalquivir River. The Novotel Sevilla hotel is located in the heart of Seville, in a bustling shopping area. Opposite is the Ramón Sánchez Pizjuán stadium, the city center is a 20-minute walk away and the metro is 109 yards (100 meters) away. Discover all corners of Seville, a colorful city filled with art and passion. There is so much art, culture and gastronomy to discover! Dare to dance flamenco with the locals and recharge your batteries at the Novotel Sevilla. I found the check-in a bit confusing at it was not what I was used to. Having said that, the overall experience was good and the staff were very friendly and helpful. Very efficient. Would stay again. The new style reception is great, much less formal, and all the staff were extremely helpful and friendly. The room was clean ( and cleaned well during our 5 night stay). We stayed as a family with 2 children and both the bed and sofa bed were really comfortable. Room was quiet. Hotel is very well situated for walking or taking metro to the centre. If you're lucky you can find free parking on the streets nearby. Finally a great buffet breakfast everyday. Overall everything we hoped it would be! Comfortable rooms, kind staff and great location (close to the Train Station Sevilla Santa Justa, good if you want to explore other cities by train while based in Sevilla). Would be nicer though if they had a sign downstairs that says the reception is at the 1st floor. Also two elevators downstairs could be used to go to any floor without using the room key. This should be fixed. Finally, we would have apreciated it if the pool were open during our stay. The hotel is ok, breakfast was good. The staff helped, but after calling several times.Didn't like that they have announced that they will cut the water 10:00 - 14:00 on the same morning it followed to be cut. Also the location of the announcement - elevator. What if I didn't pay attention? What is I decided to sleep till late? It would've been a nightmare to wake up and get to know there is no water. Modern hotel, good location, friendly and efficient staff, good restaurant meal, good breakfast, parking in the hotel building. I have stayed in many Accor Hotels over the years (before retiring from the corporate world I was a platinum member for a number of years) and this Novotel had a &quot;fresh&quot; feeling (i.e. not tired like some others we have stayed in recently). Could not get out of the parking on first attempt as there was some problem with the parking ticket. Had to come back into the hotel to have this rectified, but this is a minor point. I had a great stay in the Novotel Sevilla. My visit was work related and my first time in Sevilla. The location was great to walk into the city. The welcome staff was very helpful explaining the places to visit in the short spare time we had. The hotel is clean and rooms very spacious. The taxi call service from reception is fast and reliable. Modern hotel, good staff, parking, not so far from city center. Digital transformation is on the road :). Very convenient location. Next to the stadium, the shopping mall and not too far from the city center. Overall we enjoyed our visit to Seville. The hotel was in a good area the room we stayed in was good and comfortable. We only had breakfast in the hotel one morning was ok but had better in other Novotels. The evening meal we had i am sorry to say was below standard. the staff on reception were excellent friendly and helpful. Overall a good hotel to stay in. Staff were welcoming, friendly & attended to anything immediately. The room was clean, spacious & very comfortable. Having a fridge was very handy as we were room only. We enjoyed delicious evening meals in the hotel & the service was excellent. Staff enquired about an unexpected road closure which meant we could not catch the EA airport bus & offered to arrange a taxi instead. Very nice hotel, good facilities. Bed was a bit too soft for our liking. The Hotel an the service were really good. I only dislike the fact that the room had no welcome bottle of water. In a City like Sevilla, water is pretty needed. This is not a 4 star hotel. More like 2/3. Eating facilities are inadequate for the size of hotel. Breakfast facility is ridiculous at the weekend. We had to eat at McDonalds despite prepaying and booking breakfast. The lifts are also inadequate- waiting time was crazy. We were on the 8th floor and it could take 20 minutes to get out of the hotel! Unfortunately our stay started with a desperately slow check-in that was very frustrating. I don't know if the system of doing everything off mobile handsets is new, but it didn't seem to work terribly well and it took a long time. The set-up of the &quot;reception desk also meant that it was difficult for guests to know who was in the queue waiting etc. I had checked in online, but this appeared to make no difference at all when we arrived. Overall, the check-in was a very negative experience. The other issue was the lifts. Being on the 8th floor was nice as we had some kind of view, but it meant we waited a long time for lifts and tried to avoid wherever possible having to go back and forth to the room. Otherwise the room was nice and well appointed, the bed was comfortable and the breakfasts were good, so the frustrations of checkin were forgotten about and combined with a location that was very handy for the metro we were satisfied overall.